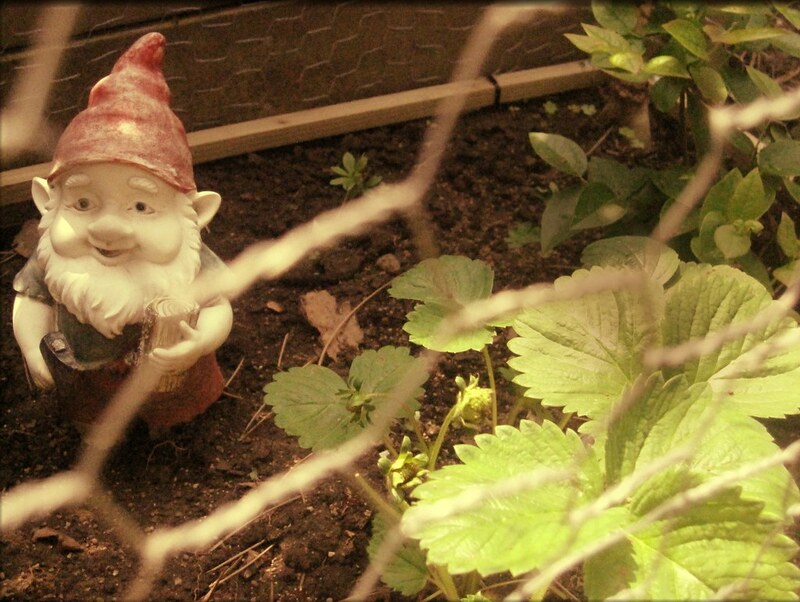 veggies in the yard, gnome is on guard | i made it so. the kids’ little corner of the garden has plants that they picked and planted for themselves 2 years ago: blueberries, strawberries and a rosebush. the roses are blooming well for the first time, and the strawberries have given fruit before, but the birds and critters have gotten to them first. and we have yet to hear a peep out of the blueberries. the gnome is on 24 hour guard. i will keep you posted. p.s. thanks to cassy for nominating me for a blog award. you can visit cassy’s knitting blog here. 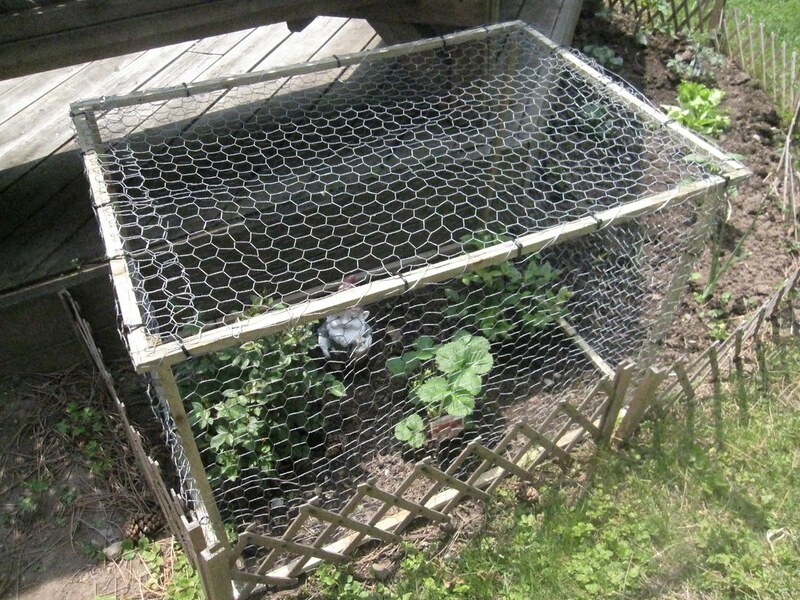 This entry was posted in green thumb and tagged blueberry plant, cage to protect strawberries, cucumbers, earwigs, garden gnome, lettuce, peppers, rose bush, tomatoes, vegetable garden, veggie and herb garden small space, veggie garden. Bookmark the permalink. Love both of your guards, the cage & the gnome. You just can’t have too many gnomes in the garden! i was going to just throw some netting over the plants, but i think this cage is great and will come in handy for other things too. LOVE the gnome! He’s so cute. :) Some can be a bit scary! The cage is great- hopefully you’ll get a few strawberries now! thanks abby! 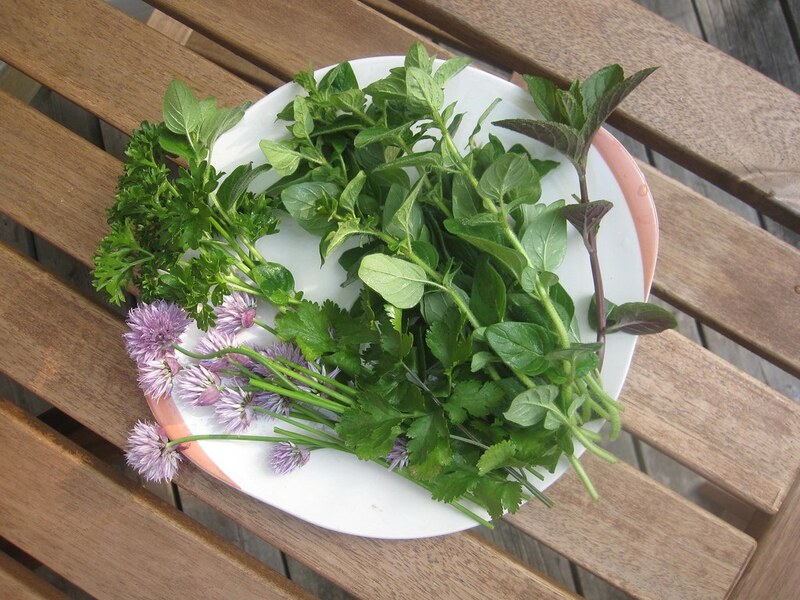 i love the blossoms too, such a burst of colour (though they do toughen up the chive stems so we can’t eat that part). we put in a blackberry bush 3 years ago. this is the first year we’ve gotten flowers and berries. yeah, i dunno.. it’s definitely taking its time. don't mind my knitting. my name is ana, and you can learn more about me here. © imadeitso, 2010-2013. all photos, artwork, text, hair-brained schemes and content are my own unless otherwise specified. i believe in sharing through collaboration. please ask for my written consent before using any material.